When you host an event that grows in popularity, it's easy to get excited. Then you have to face the bottom line. Attendance isn't the only thing that grows with success. Expenses do too. Years ago when that happened to us we had to face reality; find sponsors or shrink the event. Our decision was in favor of sponsors. Yet, there was a caveat. We'd only accept sponsorships from upstanding ethical companies. Today, I hope you'll join us in welcoming two such companies to the list of fly-in sponsors. Sporty's and UNIVAIR are the latest of legendary aviation businesses to support what we're doing here at Lee Bottom. We're excited to have them as part of the team and we hope you'll remember their support the next time you need a product or service they offer. * Did you know Sporty's Eastern Cincinnati Aviation is now our area's American Legend Cub dealer? They'll have one on display at the fly-in. * UNIVAIR has been increasing its inventory of parts for the Scott 3200 Tailwheel. They now have everything but the top bracket and fork. Click here to see their parts list. 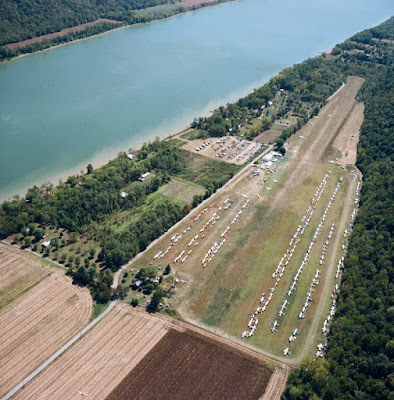 If you or your business would like to sponsor "The Aviation Migration" fly-in at Lee Bottom, contact us. There are still some great, high visibility, sponsorship options available. The date is September 18-20, 2015.